Helping Christians apply the Word of God to all | Chalcedon Foundation Education: Christian or Humanist? The great issue of the years ahead is the developing battle between Christianity and humanism. It is a war unto death. Christianity is a world and life view and faith, and it can only exist as such. It is either the Word of God for every area or none. Minimalism is the implicit heresy that scales down the Bible's teaching and the Christian Faith to its bare essentials — and often much less. Minimalists wish to arrive at a comfort zone of believing as little as they can and still be a Christian. 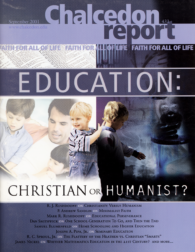 One area in which future-oriented Christians made great strides in the twentieth century is Christian education. Homes and churches in this country and abroad are graced with many multi-generational ties to solid Bible-based education. For the past fifteen years the Nehemiah Institute's ministry has been conducting a Christian worldview testing service used in Christian schools, churches, home schools, and various other Christian ministries. The Biblical basis for home schooling is to be found in Deuteronomy 6, in which God commands parents to educate their children in the love and admonition of the Lord. I have been asked to write about the nature of training men for ministry in the Reformed churches. The topic is important because we take it for granted and, in the minds of many, the future of traditional, campus-based schools is up for grabs. The Flattery of the Heathen vs. Christian "Smarts"
What if, in the great battle to build Christ's kingdom, we could capture the very center of higher learning? Wouldn't it be grand if we were the ones training the next generation of lawyers and doctors and pastors and civil magistrates? Whither Mathematics Education in the 21st Century? We who hold to the Biblical principles of worship (i.e., worshiping God in the manner He has prescribed and not worshiping Him in the manner He has not prescribed) need to view the fields of battle around us. It is time that we Christians, as watchmen, earnestly contend for the Faith (Jude 4). Selfish Christianity has long cut the heart out of Christian thinking, producing an ineffective testimony to the world. This weak testimony produces poor evangelical results.